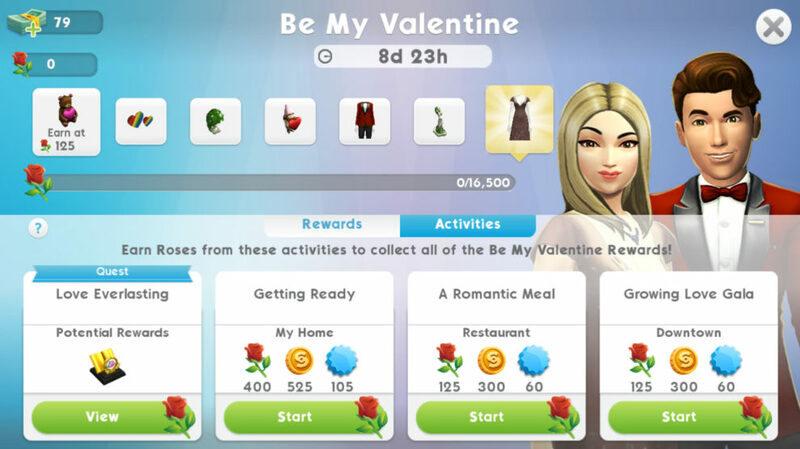 The Sims Mobile is launching a brand new event in the game called Be My Valentine! This event is going to be available in the game starting February 12th, 2019 at 10AM PST all the way through February 21st at 10AM PST. 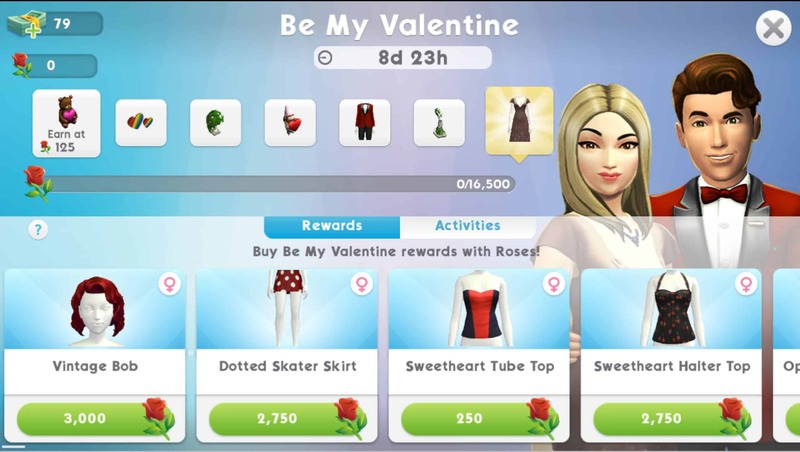 During this period you’ll be able to perform all sorts of Valentine-themed events, gain special tokens and purchase new items! The Be My Valentine Event comes with a new limited-time quest where you can gain token rewards, simoleons and most importantly, if you finish the quest in time, the My Bitter Valentine Relationship Story! The progress bar of the Roses tokens that you’ve unlocked through various events and activities. As the progress bar fills up you’ll be unlocking new items that have been marked below. 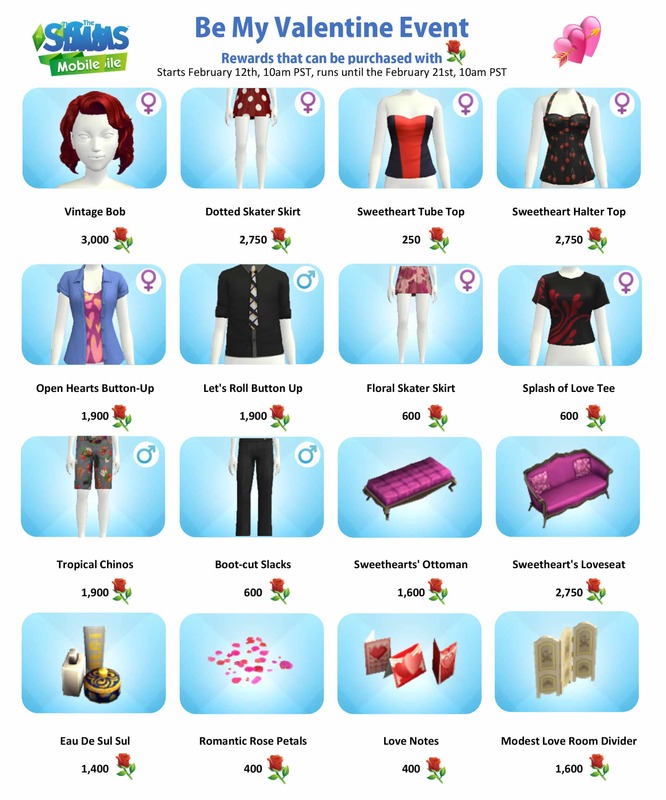 The rewards section where you can unlock new items in exchange for Roses. The activities section that lists all the events that you’ll be able to perform that’ll grant you Roses, Simoleons and XP points. There are seven different items that you can unlock through the progress bar of Roses. The most valued item that you’ll be able to unlock is the Growing Love Gown, worth 16,500 Roses tokens. Don’t be afraid to spend the Roses tokens as you fill up the progress bar – the game won’t subtract any spent tokens as it only counts the tokens you’ve earned in igeneral. Event Rewards are the rewards that you’ll be able to claim in exchange for Roses. There are 16 items in total that you’ll be able to unlock that all have different values and prices. Part 1: Earn 30 Simoleons. Part 2: Complete Dream of True Love Event in a bed. Part 4: Spend 300 Roses. Part 5: Give stickers to 5 Sims. Part 6: Complete an event. Part 7: Change your appearance. Part 8: Complete an event. Part 9: Earn 650 Simoleons. Part 10: Complete any 5 events. Part 11: Collect 600 Roses. Part 13: Complete any 5 events. Part 14: Earn 650 Simoleons. Part 15: Complete 3 standard career, hobby, or relationship events. Part 16: Complete all LlamaZoom tasks and collect rewards. Part 17: Complete 3 standard career, hobby, or relationship events. Part 18: Earn 750 Simoleons. Part 20: Complete 2 long events in any career, relationship or hobby. Part 21: Earn 1,000 Simoleons. Part 22: Complete all LlamaZoom tasks and collect rewards. Part 23: Collect 1,200 Roses. Part 24: Complete 3 long events in any career, relationship or hobby. What was the point of doing the first Valentine’s quest and earning the 3 vases? How are they linked? When you tap on the vases from quest 1, it says it’s locked. I had others ask me the same question and I can’t find any answers to it. On my game having the roses and vases from the mini valentines quest reduces the time taken for the special,quests in this event, so there is definitely an advantage to having them if you plan to complete the special quests. Do you have the option to buy the bundle (seen on other event walkthrough)? The Sims 4 Get Famous is Now Available on Xbox One and PS4!